Foxcab GAA Girls’ Summer Camp will be relaunching this summer in Kilbogget organised by David O’Connor (Foxcab and Johnstown GAA Coach), Jane O’Connell Bell (Foxcab Mentor) and a range of other qualified coaches and mentors. It will be a girl’s only camp for girls aged 6-12 years. 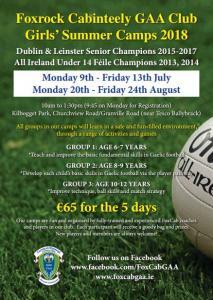 The sign up leaflets below were handed out to all girls in Johnstown, Hollypark and St Brigids schools this week. We will also have extra leaflets available in our clubhouse for any girls not in these three schools from this Saturday morning (April 14th) onwards. Our first official 'sign up' night is this Tuesday April 17th in Kilbogget clubhouse at 7:30pm. There is a limited number of places available and we have already had a high number of bookings so be quick to avoid disappointment.